By default, only users of your AODocs domain can access AODocs on your domain. As an AODocs super administrator, you can extend access to external users using the external users whitelist. You can add external users as individuals or as Google Groups. They can then access the AODocs interface. - An external user must own a Google account associated with their email address. Learn more: Access AODocs without a G Suite or Gmail account. - An external user using AODocs is counted as licensed user. - The Google Group must be a Google Group of the G suite domain where AODocs is installed. Any member of the group will be considered as being part of the external users whitelist. - External users must be whitelisted to access Secured Folders or Document Management libraries. - In Secured Folder libraries and at the document level, contributors can also add external users as additional permissions without a requesting a whitelist. Learn more: Set an additional permission in a document. 1. Open the domain administration interface. 2. Press External access in the left menu and select Group and user whitelist. 1. Press the Add button. 2. Enter one or more user or Google Group email addresses. Note: You can add as many email addresses as you want. 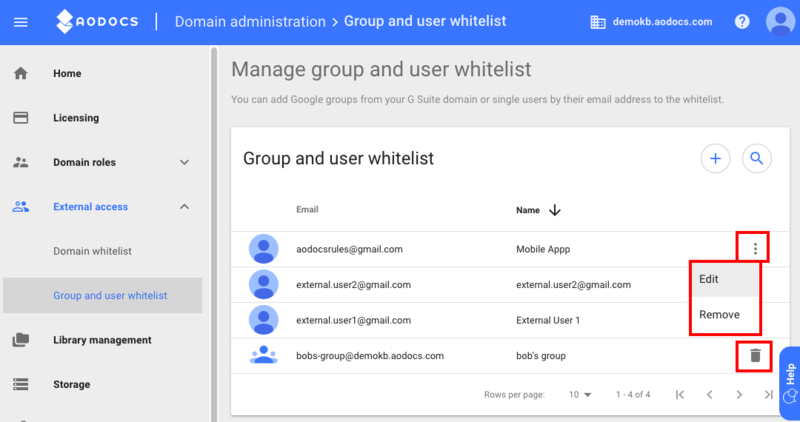 Tips: Adding a Google Group to your whitelist allows you to handle AODocs external users quickly and easily. If an external user is added to a whitelisted Google Group, this new member will become a whitelisted external user. It allows management of whitelisted users without being an AODocs super administrator. Edit to edit the name of the individual user. Note: You can't edit the display name of whitelisted Google Groups in AODocs. The name of the group is the one configured in G Suite groups. Remove to remove the email address of the individual user. 2. To remove a Google Group from the whitelist, press the Remove button. A confirmation message opens.